In my previous post I mentioned the difference in timbre between a cylindrical, conical and generically shaped didgeridoo. To quantify this there is a simple and accurate mathematical construction that enables one to calculate the resonant frequencies of a didgeridoo of a given shape. It is not too difficult to implement this as a computer program and then plot the resonant frequencies to obtain a graphical representation of my qualitative statements about form and sound. Below we can see the internal profiles of four different didgeridoos. The four shapes have been chosen such that the generic didgeridoo lies between the two extremes of conical and cylindrical, while the fourth “radical” profile has been included to show the effects of more creative changes to the internal profile. Figure 1. The profile of four different possible didgeridoos all tuned to have a fundamental tone at 60 Hz. The acoustic impedance, plotted in the diagram below, provides information on the resonant frequencies of an instrument (corresponding to the peaks of the spectrum) and also on the backpressure (related to the relative magnitude of impedance at a given frequency). 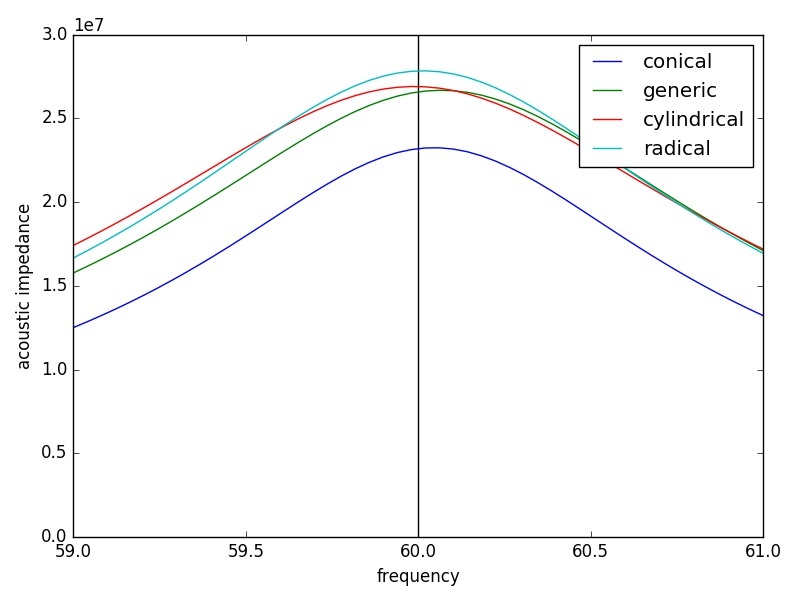 Below we see the superimposed impedance spectra of a conical, generic, cylindrical and radical didgeridoo, all tuned to have a fundamental frequency of 60 Hz. Figure 2. 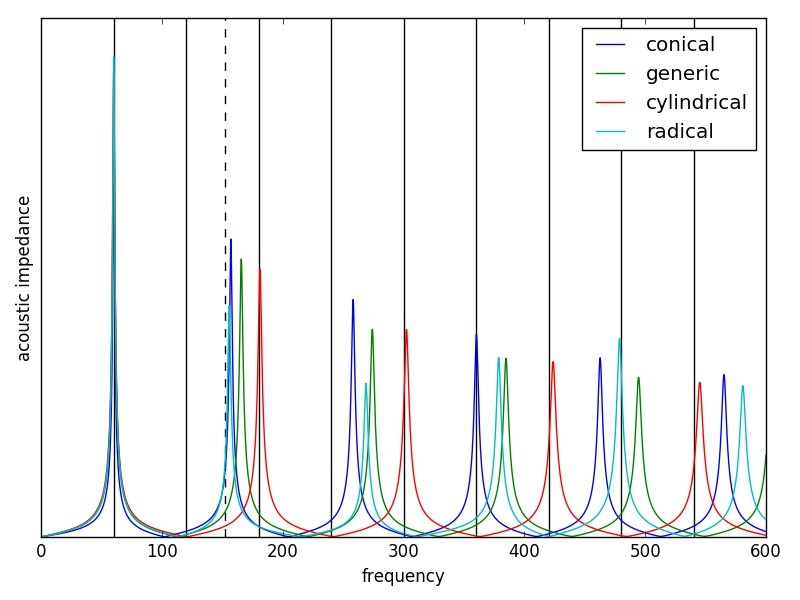 The impedance spectrum showing the resonance peaks for the four different instruments of Figure 1. The vertical lines correspond to the harmonics over the common fundamental frequency of 60 Hz (at 60, 120, 180… Hz). The vertical dashed line corresponds to a note that would be a musical interval of a 10th above the fundamental frequency, in this case it is at 150 Hz. Observing this figure we see clearly that the greatest spacing between resonances occurs for the cylindrical form and closely follows the odd harmonics of 60 Hz as one expects. The smallest spacing is for the conical profile with the second resonance being close to a musical interval of a 10th above the fundamental. The generic shape has a spectrum that lies between these two extremes while the radical profile has a less regular behaviour. This enables one to have a general feeling for the spectrum of an instrument given its internal profile. Clearly one could make strange expanding and contracting internal forms that can have greatly varied spectrums although for a completely generic form the quality of the resonances can be seriously degraded. For example one can see that for the radical profile didgeridoo the third resonance (second overtone or “toot”) at around 270 Hz has a lower impedance when compared to nearby resonances for the other three profiles. As a consequence the second toot will be more difficult to play on this instrument in comparison to the second toot on more conventional instruments. The final figure shows a zoom on the impedance close to the fundamental frequency and here we can see that in general a conical instrument has lower backpressure than instruments with more cylindrical profiles. The radical instrument probably has a higher backpressure also as a consequence of the constriction in the first part of the profile. From figure 2. on the other hand, one sees that the conical instruments have a slightly higher back pressure on overtones than the other instruments (apart from the anomalous second toot of the radical instrument already discussed above). Figure 3. A zoom in on the impedance spectrum of the four instruments around the fundamental frequency (at approx. 60 Hz). One can also learn more about the actual timbre of the notes played from the impedance spectrum. The peaks also correspond to frequencies that are easier to accentuate while playing the drone and modifying the shape of the vocal cavity. The general timbre of the instrument, when playing the fundamental tone, is determined by the amount in which the various resonances of the instrument are excited by the harmonic overtone series above the drone. For example, when playing the fundamental tone on the radical instrument one should hear a strong accentuation at about 480 Hz as a consequence of the alignment between the instrument spectrum and the harmonic series at that frequency as is clear from figure 2. An additional interesting observation is the first toot of the generic, conical and radical instruments, which is between a musical 10th and a musical 12th above the fundamental – a fact which any didgeridoo player with some experience on different instruments has surely noticed while playing. To obtain the actual audio spectrum of the instruments, meaning the frequency components of the actual played sound, one needs to combine the above results with the vibrations of the players lips. This will be the issue of an upcoming blog post.